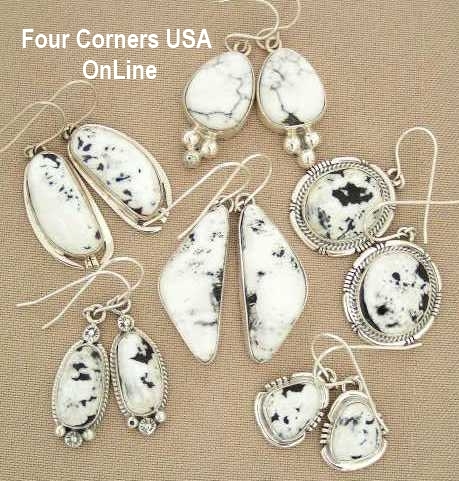 Diverse and evolving selection of Sacred White Buffalo Turquoise Earrings from Post style to French Wire Dangle in an assortment of sizes, shapes and price ranges. Cutting stones in pairs for earrings is always risky for lapidaries particularly when the stone availability is so limited by small mining operations and private collection as in Sacred White Buffalo Turquoise. Matching stones for color and matrix is particularly challenging as stones almost always vary based on when and where the stones were mined even within the same claim. When rough stone is limited as with White Buffalo, most stone cutters will maximize their hold by creating cabochons for single stone settings such as Rings and Pendants rather than running the risk of fracture while cutting matching stone for Earrings.